I recently acquired a brand-new nephew, and my youngest niece just turned two. It was time to make some wee little things. For the little guy, I wanted to sew a collared romper, but did not have such a pattern in my stash. 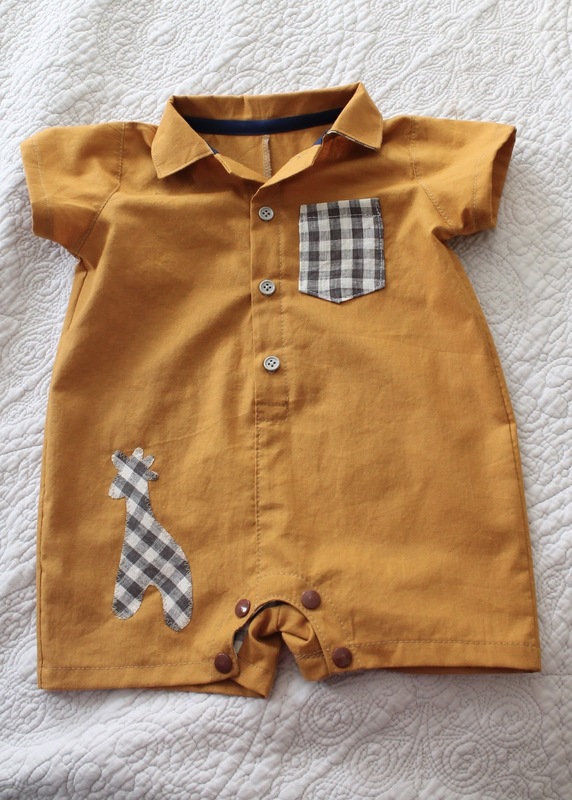 I did a little Googling, and found the Button-Up Baby Romper pattern, here from Peekaboo Patterns. The free pattern comes in a 0-6 month size. I used a length of mustard yellow cotton I found at the thrift store a few months back, trimmed with scraps of the gingham linen I used here, here and here. I didn't initially intend to add an appliqué, but when I had finished, the romper, perhaps because of the color, was looking a little prison-jumpsuit to me. 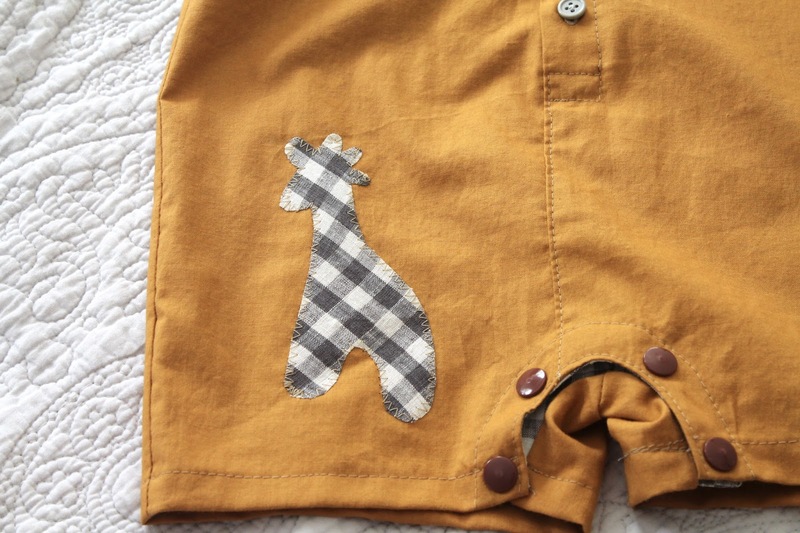 I thought about using a whale appliqué (my favorite for little boys), or an elephant, but ultimately decided the colors of the romper were more giraffe-esque. I found an outline on Google and used my computer screen as a lightbox to trace it onto my fusible web, then created the appliqué from there. 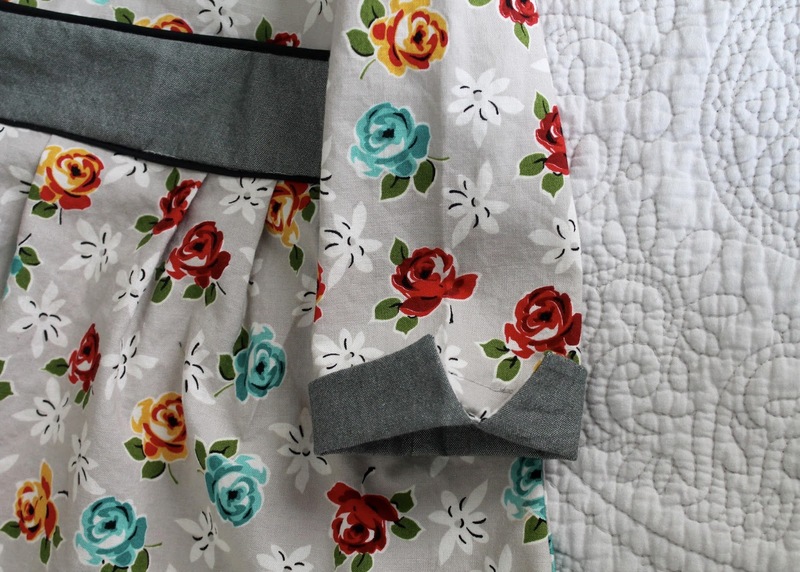 The pattern went together easily and all the seams match up, however, it only includes 1/4" seam allowances which mean it's hard to get a clean finish without thinking ahead (or seam binding). That's my only quibble with this otherwise very nice (and FREE) pattern. For my niece, I pulled out my Oliver+S Library Dress pattern, which I've used once before, and not in the way it was intended. I had in my head that the dress would take awhile to sew, but it wasn't bad. The cutting was a little less tedious than usual, because I block-interfaced my facings for the first time. I cut out the pattern pieces in interfacing first, then turned them sticky-side up on my ironing board and laid my fabric wrong-side down on top of them. Then I pressed. It seemed to save a good amount of time and I'll use the technique again. The actual sewing took me two evenings. Not bad at all. 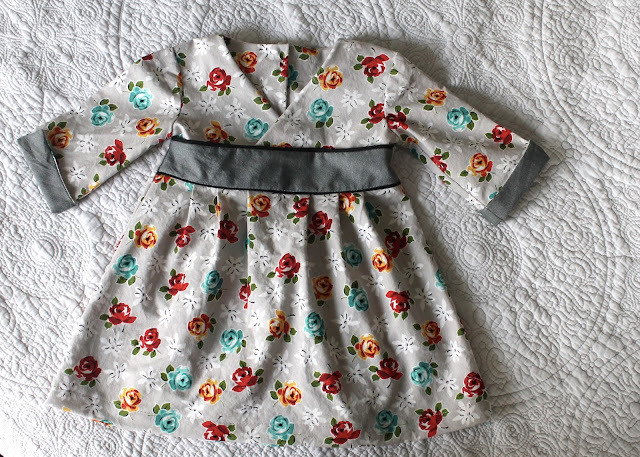 I made a 6-12 month size with the skirt lengthened to the 12-18 month. My niece is a little peanut of a thing and I have always found O+S dress patterns to run quite large. I think the resulting dress will be a good fit for this fall. I used some quilting cotton from Spotlight, which was sent to me by a thoughtful Australian friend. 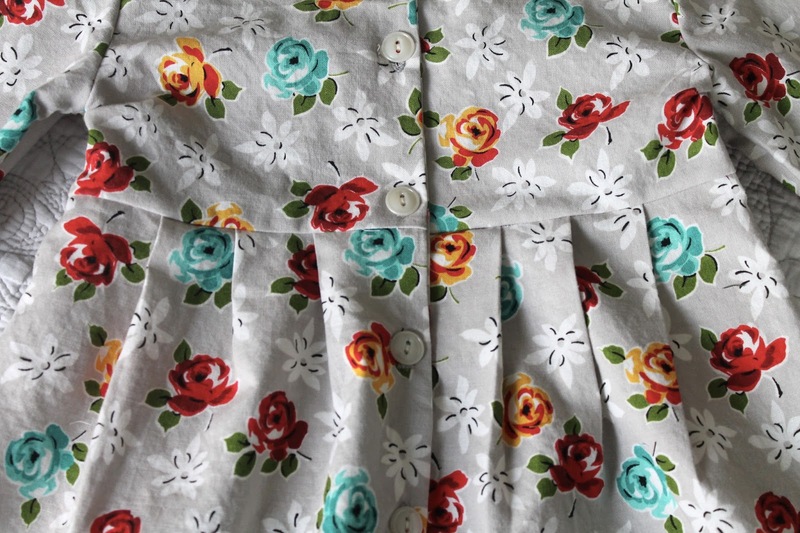 I love the print, and I don't at all mind using quilting cotton for little girls' dresses. The waistband and sleeve facing was cut from gray shot cotton scraps from my stash. Instead of bias trim on the waistband, I used black pre-made piping, also from the stash. Looking at the photos, I wish it had occurred to me to trim the sleeves with the piping as well! Maybe next time. I hadn't appreciated how pretty the details are on this pattern before now. That notched sleeve is really nice (though maybe it would have been tough to trim it in piping after all), and I love the little pleats on the front and back skirt. I might have to buy the next size up to make this for my own girls! 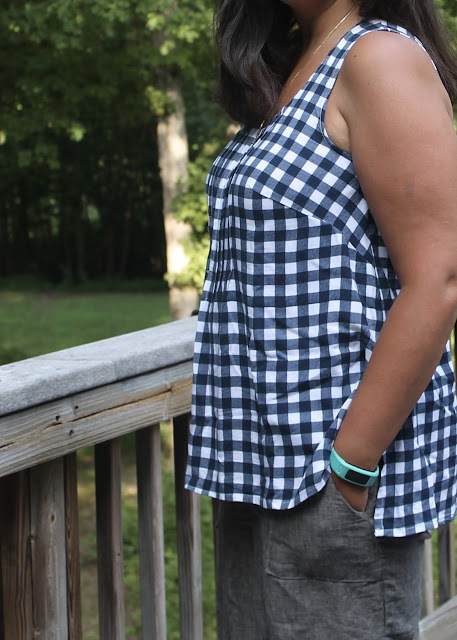 This year I started making seasonal sewing plans, trying to both use up some fabric from my stash, and create coordinates that I could mix-and-match. Most recently, I sewed what I guess could be trendily termed a "micro-capsule," which involved the two Pony tanks I posted about here, and this new pair of linen pants. 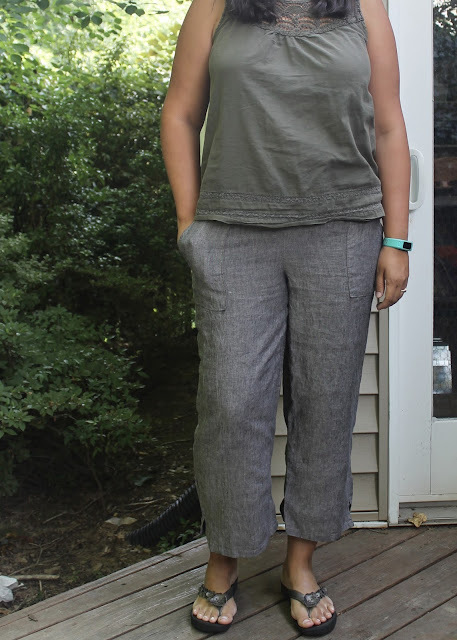 They are McCall's 7364, sewn out of this always-reliable slub linen from Joann's. I had in mind a particular idea for the pants I wanted, and this basic pattern seemed something that was pretty close and that I could tinker with until I got them where I wanted them. I liked the shape of the pant on the pattern envelope, as well as the front pocket on the shorts view. 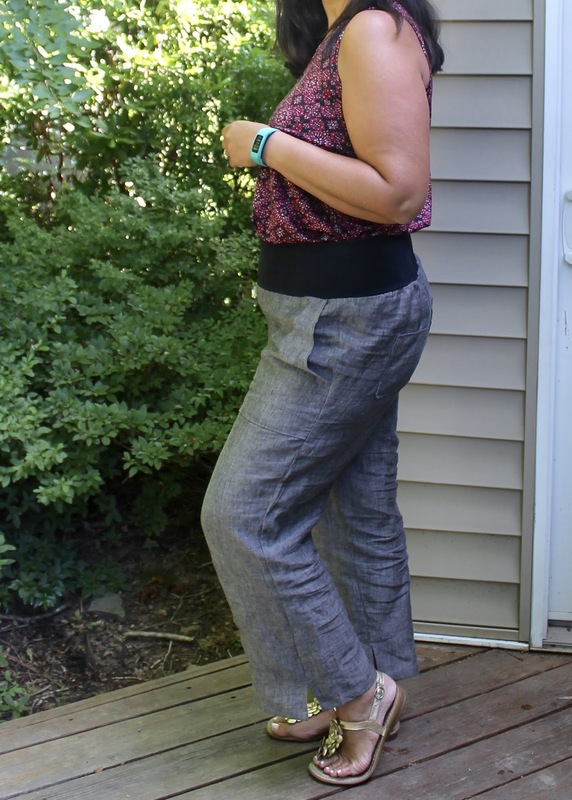 I knew I didn't want a drawstring waist (I never find that they stay up), but I planned to put a knit yoga waistband on the pants anyway. Took in the side seams evenly at about mid-hip down to my knee by 3/8". Took in just the back piece side seam about 1" starting at mid-hip and ending a few inches above the hem. Raised the back by 1" at center and shortened the front rise by 1". Scooped out the back crotch curve by about 3/8". Took in both the front and back center seams by about 1" at the top, tapering to nothing halfway down. Took in just the back inseam by 1" at the crotch curve, tapering to nothing about 8" or so down. 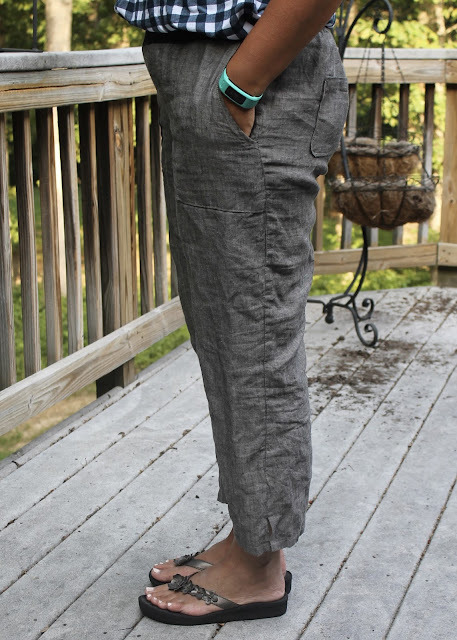 I realized after washing and putting on these pants again, though, that I had done a lot of my alterations after the pants had already bagged out quite a bit - being linen, there is no recovery. So the just-out-of-the-wash pants (photographed with an olive green tank top) are a touch tight in the thighs. They do relax into the shape I want relatively quickly (see all the other photos). My finished yoga band, made of cotton/lycra rib, is about 2" wide, and threaded through with 2" wide elastic. It's very comfortable and stays put. 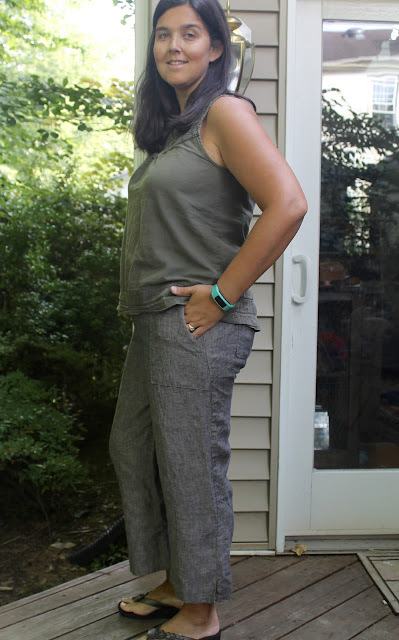 I originally tried to make a knit-fabric-only band that was wider (you can see it in the photo below, of the pants after I've worn them a bit), but they didn't stay up. So I had to cut the band down to fit the elastic I had. 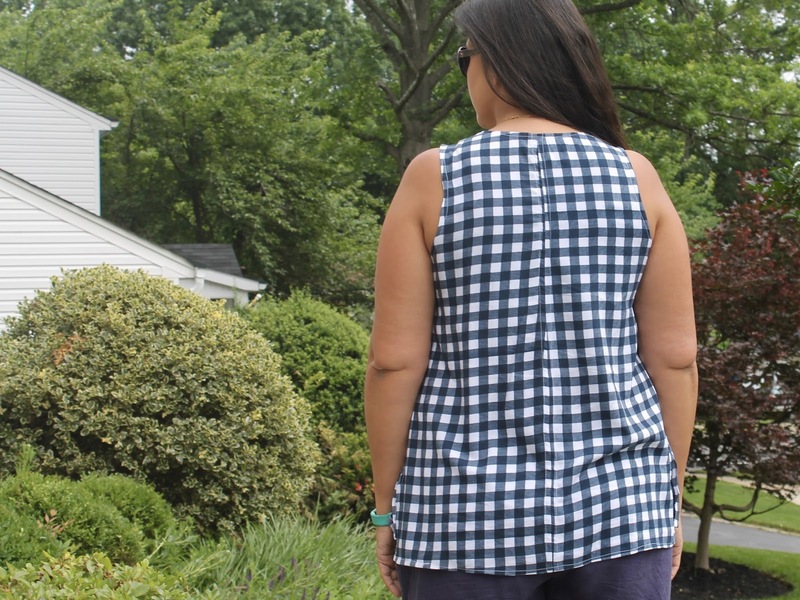 I loved the shape, the length, and the breezy linen. The bum is a little baggy as seen below, but I always wear a longer top with them, so no one is looking at this view. The back pockets are a bit too small; if I make these again I should enlarge them. But I really like the shape of the front pockets. Since finishing these pants about four weeks ago, I've worn them at least twice a week. They are very comfy for our hot and sticky weather, and if I had time (I don't), I'd make another pair. I'm halfway through three men's shirts I need to make before we got to the beach in 2.5 weeks, so it's unlikely I'll be doing any more selfish sewing this summer. Luckily, I've already kitted my vacation wardrobe out pretty well this summer (see here, here, here, and here). Immediately after finishing my replacement Kaffe Fassett Josephine, I sewed up another one. I had a yard of this rayon challis in my stash (what else does a girl like me - or you - do with an Amazon gift card, anyway?) and it was just enough to squeak out the pattern (this was helped by the fact that I had previously modified the back to have a center seam). piece. I think I had to cut the front bodice piece slightly narrower at the hem to squeak the top out of a yard. 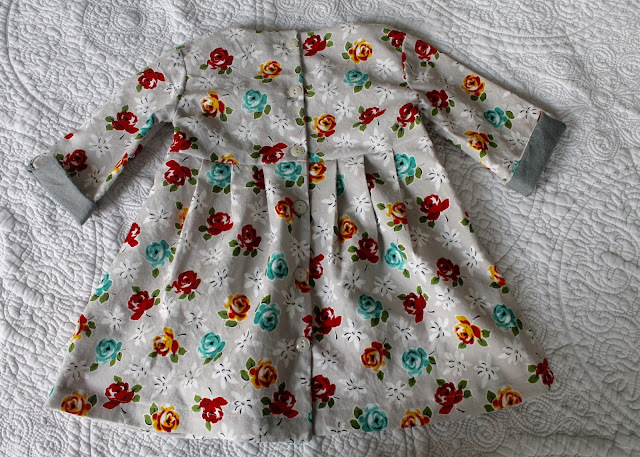 The modifications are the same as the floral version, but this time I sewed the release tucks a couple inches longer. The rest of it is exactly the same. And just like the last version, I used some cotton shirting to make bias tape to finish the armholes and neckline. Rayon challis is a great fabric to use for this pattern. 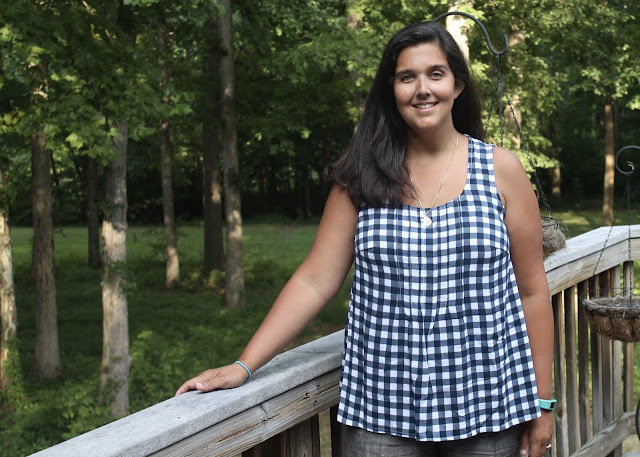 It keeps all the volume of the fabric below the tucks in check, so you get a breezy top that doesn't look like a muumuu. 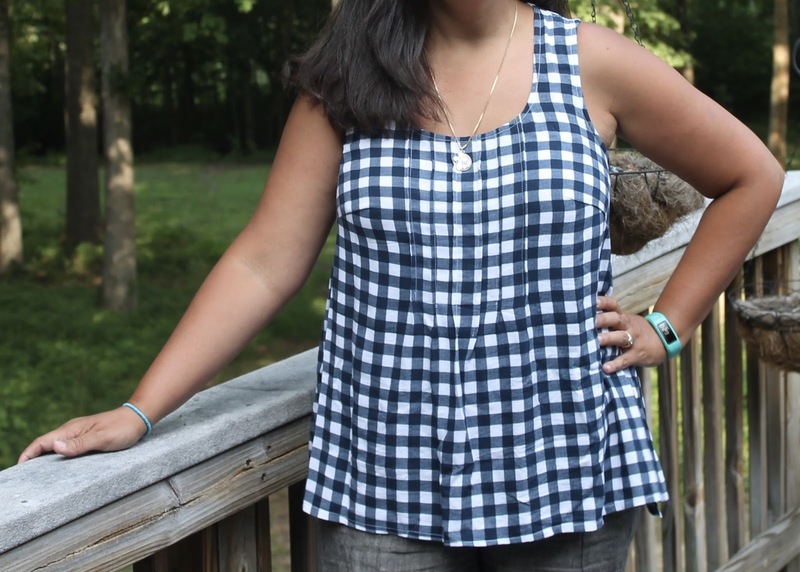 I am also an eternal fan of plaid in general and gingham in particular (as evidenced by several recent makes), so this has been getting a lot of wear in the past month. My pattern matching on the back isn't perfect, but I'm digging the slight wonkiness. And I'm so glad I took the time to get this pattern to where I wanted it. My former neighbor in Georgia, who now lives in Fiji, passed through town a couple of months ago. She very thoughtfully brought me some fabric and a pile of coconut shell buttons. Orange happens to be my husband's favorite color, so it was clear that this cut had to become a Fijian bula shirt. This is the Colette Negroni, which I've had in my stash for a couple of years, but which I'd never sewn before. I sewed a size M according to J's measurements. I actually added two inches of length for my 6'1" husband, but it turned out he didn't need them. The size M fits his shoulders and chest well but it was a little snug in the belly area, so I ended up sewing the side seams up with a 1/4" allowance, blending to the prescribed 5/8" allowance when I got to the sleeves. I'm quite proud of my pattern matching across the front. I also really like the way the print looks on him. 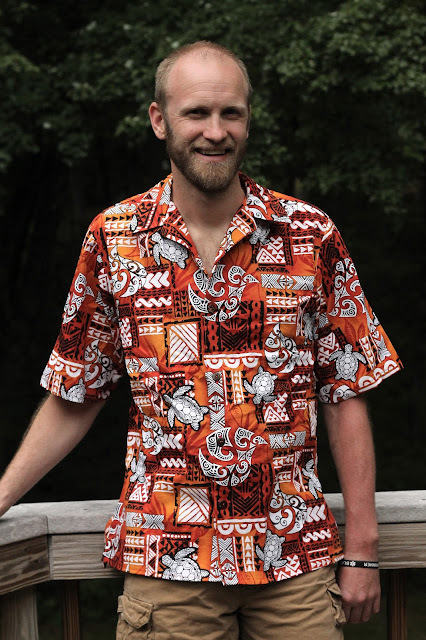 The pattern is busy, but it's perfect for a breezy vacation shirt, and we both love the flame red and orange shades. I've never seen a shirt with a facing like this in RTW, but when I went looking for other patterns, I found that a lot of the Big Four options also had facings instead of plackets. Is this a common finish for a home-sewn shirt? In any case, now that I've got more crazy shirt sewing in my future (my brother has requested one for his birthday, and we ordered more fabric to make J one, as well), I'm shopping around for another pattern. One with a regular button placket. I think I'm going to try the Fairfield from Thread Theory, with the downloadable wider collar option. 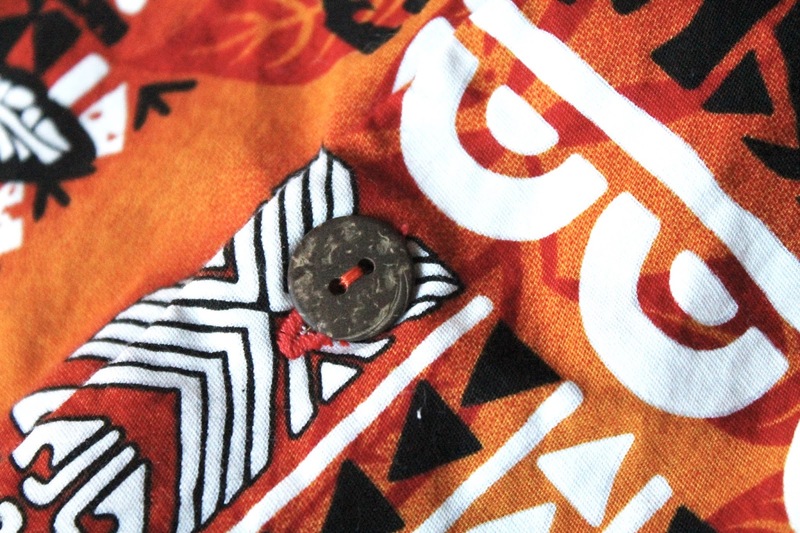 I will also be using more of these awesome coconut shell buttons. J is looking a bit perturbed at the additional housework his shirt will require. But not perturbed enough to stop wearing it.